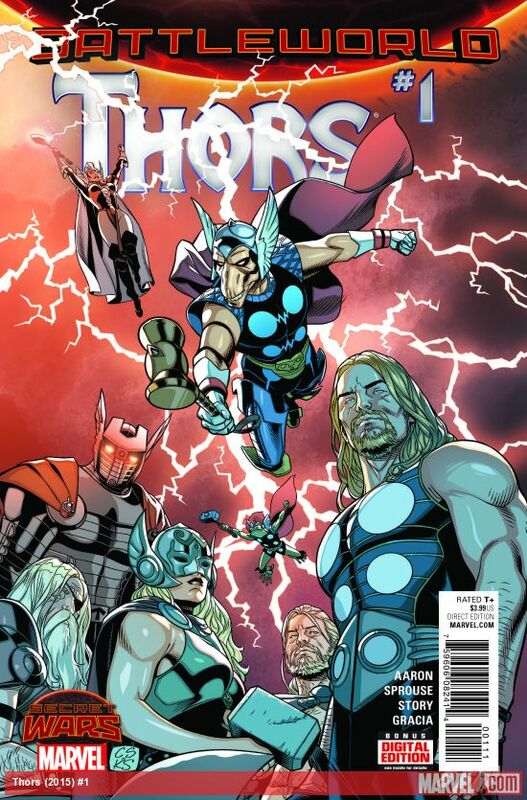 Tying into Secret Wars, we have Thors #1. This book, obviously, focuses on the various incarnations of Thor that police Battle World. I wasn't as impressed with the many Thors in the main Secret Wars book because they more or less all seemed like clones of the same character, but in this book we get to learn more about the elite group of Thors which create a colorful cast for Doomgard's Hall of Homicide. I like how the theme of the book leans more toward a mystery/detective story. Considering how fantasy driven a Thor title would typically be, this story felt very refreshing and entertaining. I so enjoyed the humor in this book. Because of all of this and more is why I chose this book for my Pick of the Week. The mystery of the story stems from a serial killer on the loose, killing women. Something seriously fishy is going on because all of the women have something in common, despite being from different kingdoms. The speed in which the murders is happening is noteworthy too. So far it's been five women killed in the span of a week. No hint is given as to the murderer's motives, as of yet. The Thors are trying to figure out what to do first. Leading the investigation is Thunderer Thorlief and Stormbreaker Ray. Just seeing the cast of characters interact with each other is so great. Some Thors have stiffer attitudes than others but they all work towards their common goal. "Tree" Thor is hilarious. He's obviously like Groot. Instead of only ever saying "I am Groot," he says "I am Thor." Throg is cute too. He doesn't look much like a Thor except for the little hammer secured to his waist. There's quite a bit of running around for information from the two lead detectives and the only data they are able to gather so far is what the women had in common. A very suspicious Loki lurks in a dirty alleyway. For some reason, his look reminds me of the Riddler and I imagine him holding Doomworld hostage to his riddles and pranks. He also comes across as a really creepy looking bum and I think that mostly has to do with his expression and his hat. The story ends with a sixth murder. The thing is is that the victim is not a woman. We get the reveal of the identity of the murdered women, however. It's a suspenseful ending and definitely makes me want to read more to find out who's behind these murders and why. The artwork is solid especially the character work. I also think the design of Valhalla's Mead Hall is really cool with the hammers hanging down from framework attached to the ceiling. Be sure to check this book out for yourself if you haven't already. It's really good.